The seminary conducts two Community Formation Days each year. A broad range of topics are addressed which pertain to the mission of the seminary and the particular concerns of the formation program. Frequently, these days are offered with the entire seminary community present. The workshops address issues such as: seminary formation and evaluations, fraternal charity and peer observations, collaborations in ministry, skills used in collaboration and conflict management, maintaining professional boundaries, and ministry in a multicultural Church. Approximately once a semester each formation year gathers for a meeting centered on a formation topic. The formation evenings are developed in consultation with the class moderators and the students. Topics are chosen from the criteria which pertains to that level of formation and from the interest shown by the class. 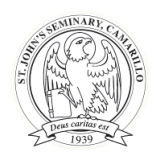 Special emphasis is given to further the discussion about topics addressed during the St. John Vianney Conferences, Rector’s Conferences, the Spiritual Director’s Conferences, or other areas of concern in seminary formation. These include: celibacy, transition issues to or from seminary life, simplicity of life, community building, and relevant class issues or concerns. The formation evenings give faculty members, students and invited guests an opportunity to interact on a pastoral level and facilitate integration in all aspects of seminary formation: intellectual, spiritual, pastoral, and human.